Valis is a Northwestern rock group whose 11-tracks of psychedelic stoner groove is the next logical progression from these grunge rock veterans. Having spent time in Screaming Trees and Tad, the members of Valis are no strangers to the art of rocking out, and they truly let loose from the get go on Head Full of Pills, as the familiar stomp of fellow rocksters QOTSA can be heard all over "Welcome to Homeschool". The continuous flow of solid rock 'n' roll is commendable here: "Motorbike" contains the grit of AC/DC meets Fu Manchu, while "Across the Sky" is a well-textured, theremin-induced trip. 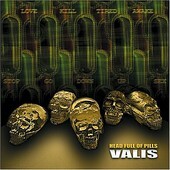 While Valis may not be the most original band on the scene, the organic riffs and rich instrumental layering found on the title track and "Perpetual Motion Machine" more than compensate for the band's approach.